Black holes can't fully be described by general relativity, but physicists hope to understand the inner workings of these strange objects by applying a theory called loop quantum gravity. Kai Staats, filmmaker and science writer, was the co-founder of Terra Soft Solutions, former developer of Yellow Dog Linux and POWER architecture HPC systems. He is now working on his M.S. in Applied Mathematics at the University of Cape Town, South Africa. Staats contributed this article to Space.com's Expert Voices: Op-Ed & Insights. In 2007, when Sony, Microsoft and Nintendo were racing to deliver the most powerful desktop game box on the market, astrophysicist Gaurav Khanna of the University of Massachusetts, Dartmouth, was racing to the local Walmart to purchase not just one, but sixteen Sony PlayStation3s (PS3). An avid gamer he is not — what he accomplished with those PS3s was quite different from what Sony corporate may have intended. While others have traded their PS3s in at the local game exchange, in the ultimate DIY effort, Khanna has acquired 200 additional PS3s — with 200 more en route — and built a supercomputer inside a refrigerated semi-trailer on-campus at the University of Massachusetts, Dartmouth. Astrophysicist Gaurav Khanna of UMass Dartmouth connects Sony PlayStation3 gaming systems into a single system, a supercomputer he and his colleagues use to study black holes. Those tiny, shiny black boxes are creating massive black holes. Virtually, of course, but what Khanna is simulating is changing the contemporary understanding of how black holes interact with stars, other black holes, and even how a black hole can take a tour of its local galaxy, like a rapidly deflating balloon whipping around in circles until it screams across the room. With collaborators Richard Price, a physicist at the University of Texas in Brownsville, and Scott Hughes, an astrophysicist at MIT, Khanna performed a careful study of black hole behavior over the past few years using an advanced computational model. While the capacity for a black hole to eject itself from its host galaxy has been theorized for some time, a new property of the "kick" mechanism may bring the black hole to a dead-stop some distance from where it started. This bizarre "anti-kick" was discovered through intense, mathematical models and simulations Khanna and his colleagues employed, as published in a series of research papers which have appeared in Physical Review. When gravitational waves arise from a binary black hole system — two black holes or a black hole and neighboring star bound to each other in decaying orbit — they have an interesting physical impact. True to the law of conservation of momentum, gravitational waves not only carry energy away from the system, causing the shared orbits to decay or "in-spiral," they also carry away momentum. As the gravitational waves are emitted, the binary black hole or black hole / captured-star system experiences a "kick," or backward recoil, much like that felt when shooting a rifle. The recoil velocity can amount to several thousand kilometers per second (km/s) and may actually eject a black hole from its host galaxy. Sony PlayStation3s process the secrets of the universe at Umass Dartmouth. What's even more strange, under special conditions at the very late stage of the black-hole merger, there may be a precisely equal amount of anti-kick that completely cancels the full velocity (speed and direction) of the original kick. This results in a black hole binary system starting out in one location, wobbling for a bit, taking off at high speed for the brief, strong emission phase — only to be brought to an abrupt stop due to the late-stage anti-kick. The total binary system may be displaced large distances during such a merger, kick and anti-kick process. Why do black holes kick? The intuitive explanation for that behavior goes as follows: Black hole event horizons — regions of space wherein even light gets trapped due to the strong pull of gravity — have a rather intriguing "locking" property, i.e. 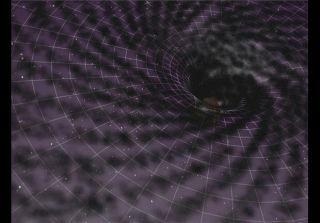 when a large spinning black hole is capturing a smaller object, at the late stages of the capture process, the smaller object must move in lock-step with the event horizon. The container unit where UMass Dartmouth professor Gaurav Khanna stores his collection of more than 200 Sony PlayStation3s, all hooked together as a single, massive processor unit. Now, this introduces profound differences between the process of capturing an object sharing motion in the same direction as the horizon (pro-grade), or the opposite-direction (retro-grade). In particular, if the motion is retro-grade, the object must turn around completely so that it indeed locks to the horizon motion. And it is precisely this dramatic turn-around in the late-stage motion of the object that is responsible for the difference in whether or not a black hole has an anti-kick in the late stages of the capture process. Khanna's linking of hundreds of affordable computers (commodity off-the-shelf, or COTS, systems) — into a single system is a common approach for solving complex computational research problems in nearly all areas of science and engineering. The idea of using consumer gaming hardware, such as the PS3, to build low-cost powerful, supercomputers was pioneered by Khanna back in 2007 when he built a small, eight-PS3 cluster and was able to perform research-grade simulations of black hole systems. Research institutions worldwide have appreciated and implemented this approach for several years. The Air Force Research Lab (AFRL) in Rome, N.Y. implemented it at a large scale in 2010, using 1,716 PS3s, demonstrating ten-fold higher cost-effectiveness of such a system over traditional supercomputers. Under the auspices of a Department of Defense Cooperative Research and Development Agreement (CRADA), the AFRL has granted a significant chunk of their cluster to Khanna's research group: four racks of PS3s — translating to 176 units with associated networking gear, cables and software. A challenge for Khanna's group was to develop a suitable environment for the machines (proper power and cooling capacity) at very low cost, and also as expeditiously as possible. At the suggestion of this author, building upon my experience in working with unique clusters, Khanna purchased a refrigerated shipping container, or "reefer," of adequate size and cooling capacity. He then conveniently parked it on campus with power and network drawn from a nearby building. The entire process was completed from beginning-to-end in a matter of months, and the cluster has been in full production operation since Winter 2014. Now, the PS3 supercomputer is currently being used by Khanna to perform large and complex calculations not only in the context of black hole astrophysics, but also to explore vulnerabilities in cybersecurity. This cluster's performance is comparable to nearly 3000 processor-cores of a typical laptop or desktop, at a significant cost and energy savings. "We've estimated the cost-effectiveness of the PS3 cluster to be ten-fold over using standard supercomputer parts," said Khanna. "Moving forward, we hope that the system will be able to further shed light on the detailed properties of gravitational waves emitted from black hole binaries, and also help explore additional astrophysical aspects of such systems." Ultimately, the advanced HPC system will find use beyond black holes. The Laser Interferometer Gravitational Wave Observatory (LIGO) will be working with Khanna and his collaborators to improve gravitational wave emission-source models, a critical part of LIGO operations.